This article provides useful advice on how to avoid some common problems encountered for Ramadan diet. If followed, it would enable one to fast comfortably and enjoy fully the spiritual benefits of Ramadan. During the holy month of Ramadan, our diet should not differ very much from our normal diet and should be as simple as possible. The diet should be such that we maintain our normal weight, neither losing nor gaining. However, if one is over-weight, Ramadan is an ideal time to normalize one’s weight. In view of the long hours of fasting, we should consume slow digesting foods including fiber containing-foods rather than fast-digesting foods. Slow digesting foods last up to 8 hours, while fast-digesting foods last for only 3 to 4 hours. Slow-digesting foods are foods that contain grains and seeds like barley, wheat, oats, millet, semolina, beans, lentils, whole meal flour, unpolished rice, etc. (called complex carbohydrates). The foods eaten should be well-balanced, from each food group, i.e. fruits, vegetables, meat/chicken/fish, bread/cereals and dairy products. -Foods containing too much sugar. -Too much tea at sehri. Tea makes you pass more urine taking with it valuable mineral salts that your body would need during the day. -Complex carbohydrates at sehri so that the food lasts longer making you less hungry. -Haleem is an excellent source of protein and is a slow-burning food. -Dates are excellent source of sugar, fibre, carbohydrates, potassium and magnesium. -Almonds are rich in protein and fibre with less fat. -Bananas are a good source of potassium, magnesium and carbohydrates. 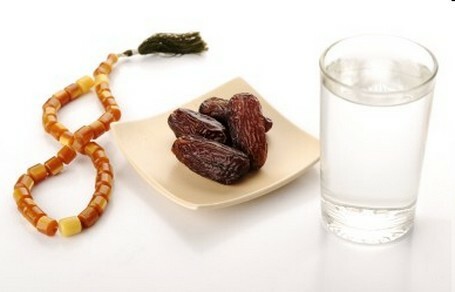 -As much water or fruit juices as possible between iftar and bedtime so that your body may adjust fluid levels in time. CONSTIPATION – Constipation can cause piles (haemorroids), fissures and indigestion with a bloated feeling. – Excessive sweating, weakness, tiredness, lack of energy, dizziness, especially on getting up from sitting position, pale appearance and feeling faint are symptoms associated with “low blood pressure”. This tends to occur towards the afternoon. Herbal and caffeine-free teas may be substituted. Reorganise your schedule during the Ramadan so as to have adequate sleep. – Weakness, dizziness, tiredness, poor concentration, perspiring easily, feeling shaky (tremor), unable to perform physical activities, headache, palpitations are symptoms of low blood sugar. Causes in non-diabetics: Having too much sugar i.e. refined carbohydrates especially at sehri. The body produces too much insulin causing the blood glucose to drop. Increased acid levels in the empty stomach in Ramadhan aggravate the above conditions. It presents as a burning feeling in the stomach area under the ribs and can extend up to the throat. Spicy foods, coffee, and Cola drinks worsen these conditions. Causes: During Ramadan, when extra Salâh are performed the pressure on the knee joints increases. In the elderly and those with arthritis this may result in pain, stiffness, swelling and discomfort. Remedy: Lose weight so that the knees do not have to carry any extra load. Exercise the lower limbs before Ramadhan so that they can be prepared for the additional strain. Being physically fit allows greater fulfilment, thus enabling one to be able to perform Salâh with ease.